When the market for your SaaS solution or service is taking off you have to run as fast as you can to capture market share and grow your customer base. And when you are late with your products and services it is even more important to increase the rate of adoption and to generate growth. How accelerating conversion and increasing retention fuels adoption and growth. When you are launching your product in a growing market you generate traffic and convert visitors to your website into trial customers and leads. But when you are launching your product you often don’t know how much of the potential market is still remaining. Your competitors are taking their share of the market and customers may become unavailable, for example because of a new technology or because of demographic change. That means you need to find ways to accelerate adoption and generate customers as fast as possible. The good news is that your happy and active customers are your best sales people. Through word-of-mouth promotion they influence others. This can be a powerful force and increase your inflow of visitors to your website, trial customers and eventually paying customers and subscribers. But in most businesses the marketing budget is limited, time is running fast and there is only so much you can do with advertising. And that’s why we need to explore what you can do to enable the powerful word-of-mouth promotion. 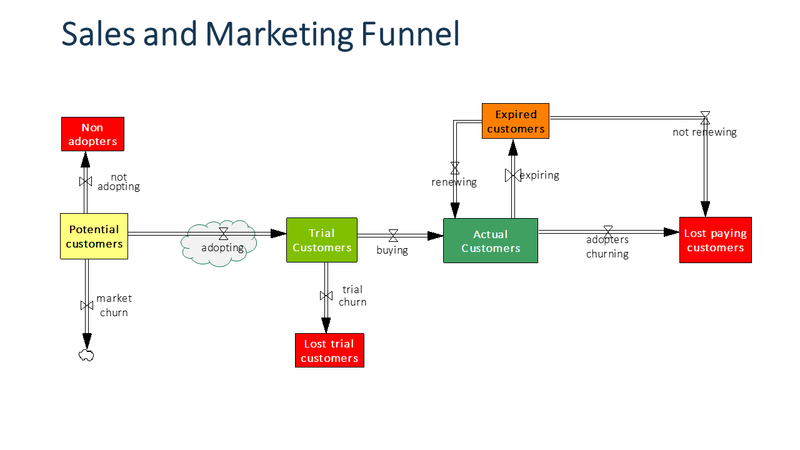 Once the customers are in your marketing funnel or on your SaaS platform they must be in one of these buckets: either they are a trial customer, an active and paying customer or an expired customer. If they left your trial and SaaS product then they are considered as lost customer. Your focus is of course not only on knowing how many customers you have in which bucket but more importantly how you can impact the flows between these buckets. 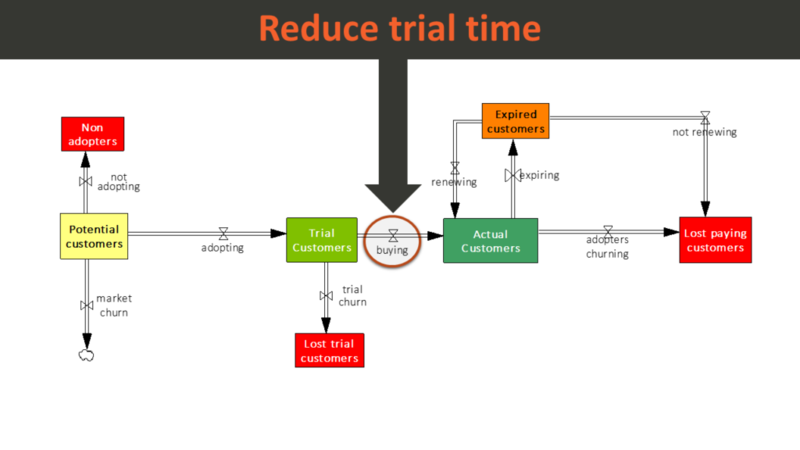 For example, how can you make sure that customers are purchasing the product after the trial. Only customers who are active users – either in the trial or the regular product – tend to have a favorable impact on other potential customers. Let’s take a look how each of these strategies play out over time and which tactics are suitable for generating the impact. When you increase the flow of customers who are renewing their subscription you are increasing the base of active customers. This is one area where you can leverage the compounding effect of the word-of-mouth promotion. As a result, you retain customers for a longer period of time and your customer base is larger and remains longer. Retention starts with on-boarding! Make sure you take care of your customers already during and right after the purchase. When their subscription expires it is often too late. Make sure customers are using the product or service. Only customers who have an actual experience with your product and who will find it useful will keep using it. Implement retention survey. The survey should provide insights what customer love about the product and about your company and what are the areas of satisfaction. A professional survey should also give you insights about the implicit drivers of satisfaction and retention. More about that in another episode. Implement a lost customer survey. Even when a customer does not renew the survey it is important to understand their reasons and motivation in order to improve the service in future. Often the lost customer survey can be a final opportunity to win back customers. Customer success engagement managers are a great way to ensure that the customer is using the product the best way possible. In some B2B oriented businesses, the customers are even prepared to pay for this service when it helps them to be more productive. Wouldn’t it be better the prevent expiring contracts in the first place? Yes, for sure. Though you need to make sure that customers want this and that it does not come as a surprise for them. Otherwise, this would be the last time they missed the cancellation period. 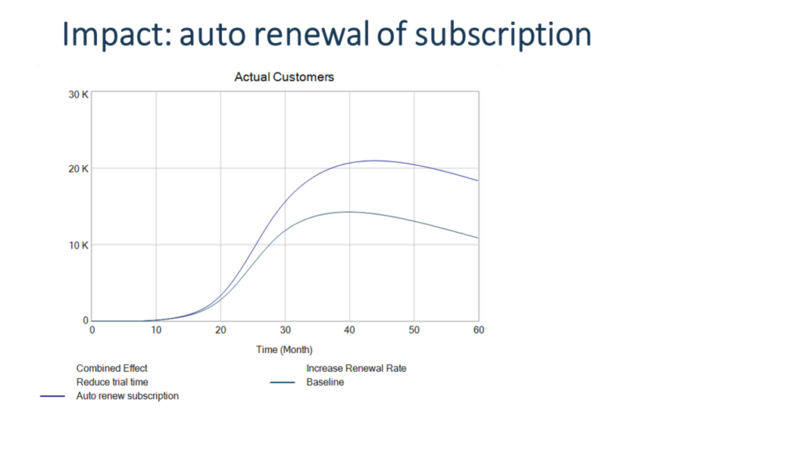 When we look at the impact of reducing churn we need to keep in mind that customers can churn as “active customers” and as “expired customers”. Ensuring automatic renewal of contracts eliminates one of these flows. And we can see already the difference in the customer base growth compared to only increasing the renewal rate. 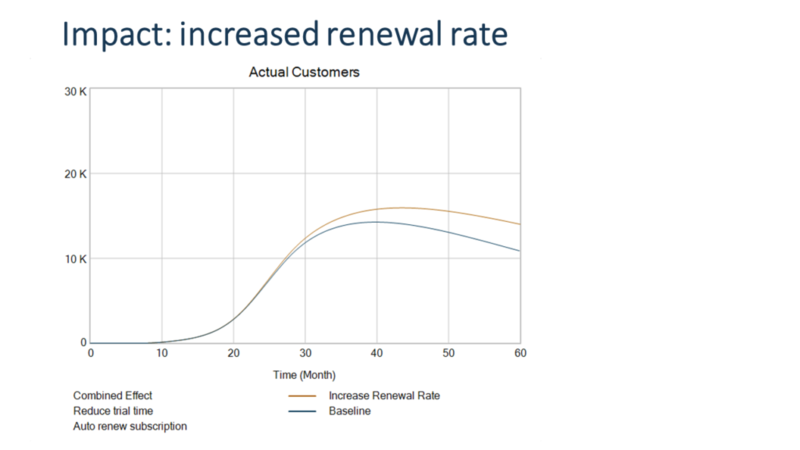 The following chart shows the individual and isolated impact of automatic renewal on customer base growth. Note the difference during the growth phase. It indicates that this strategy contributes even more the acceleration of the rate of growth. Inform customers as early as possible about automatic renewal. This helps preserve the favorable customer experience. Offer a bonus or incentive for customers who are not yet on the automatic renewal plan. Defining the right length of the trial time period is often a hot topic. There are different schools of thought. One possible opinion is: “We need to give customers more time to have a full experience before they purchase”. Another possible opinion is: “Either they purchase in the first days or weeks of the trial or they never convert”. It is always a good idea to test these different hypotheses in your business. 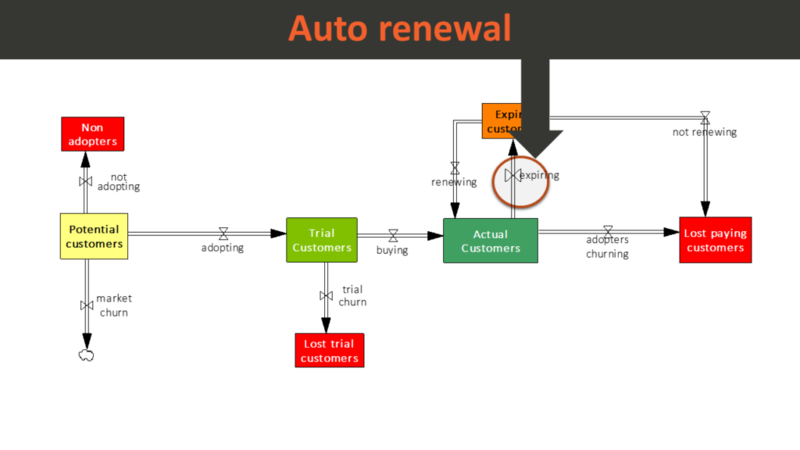 What happens when we reduce the trial time? 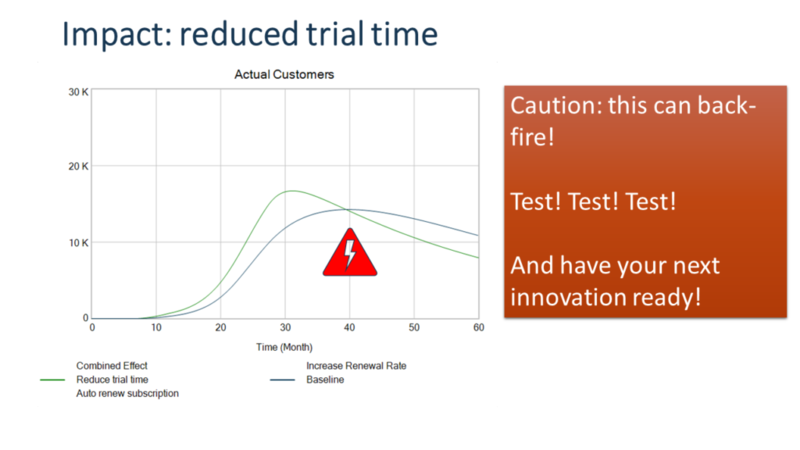 All things equal, the effect is that we are accelerating the flow of customers from trial to paying customers. 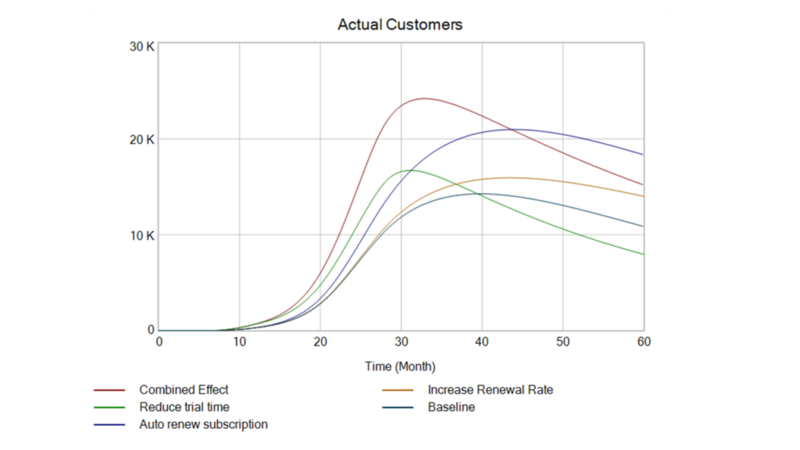 But the other effect which is rather undesirable is that we are also accelerating the churn of the trial customers. 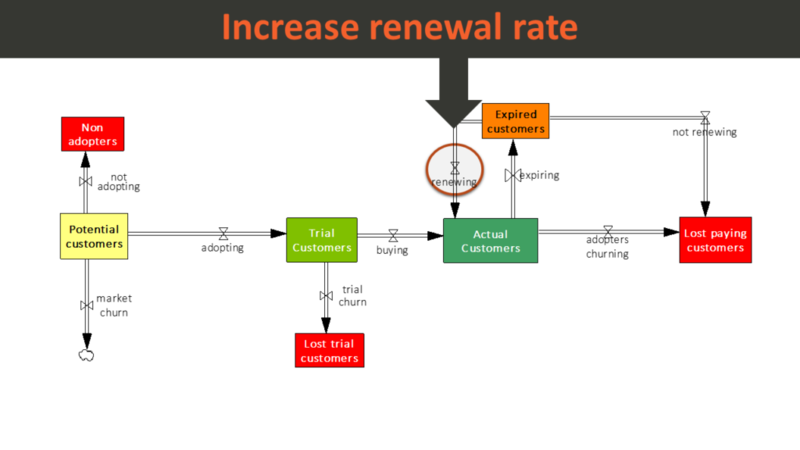 Therefore, it is vital to test how different trial times impact the conversion rate in your business model. A word of caution: when you accelerate the adoption, you are also reducing the pool of potential customers more quickly. As a result you need to be prepared much sooner with a new market entry or a product upgrade to address other market segments. Create “Aha!” moments within 10 days. Make sure build these aha-moments into the product and into the customer experience. Offer a incentives for conversion such as special deals, bonus, add-ons etc.. Provide a satisfaction money back guarantee. This lowers the entry barrier and the risk of make a wrong purchase decision. Scarcity: e.g. a limited number of seats. Urgency: e.g. a limited time for a special offer. Customer success managers can engage to help the clients get up and running and get the best out of the trial time. Offer a tutorial “how to get the best out of your trial”. This is the second-best alternative to the customer success manager. Each strategy and tactic has an individual impact on growth of the customer base. Taken together, they can multiply the effect. The following chart shows the combined effect. In this performance scenario the business has a better chance to capture a significant share of the market in a shorter period of time. 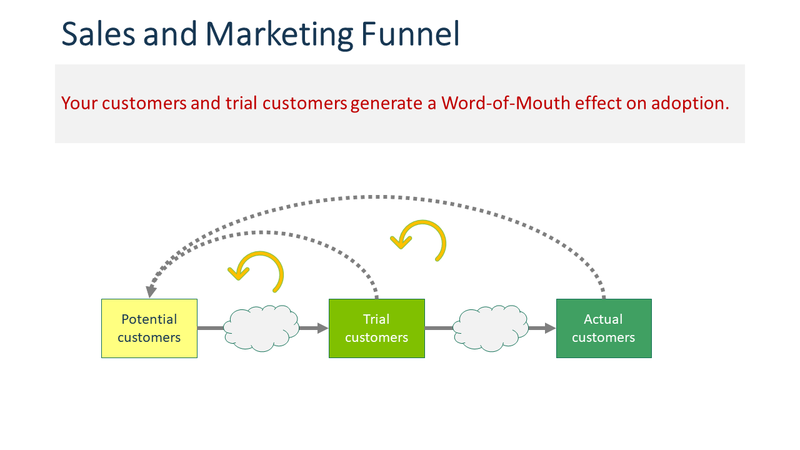 In the following simulation experiment we are a looking at the customer base at different word-of-mouth strengths. In this case we are varying the number of contacts a paying customer has with potential customers from 5 to 30 contacts per month. You can see that this as a significant impact on the adoption and installed base growth. A high number of contacts generates the s-shaped growth curve. 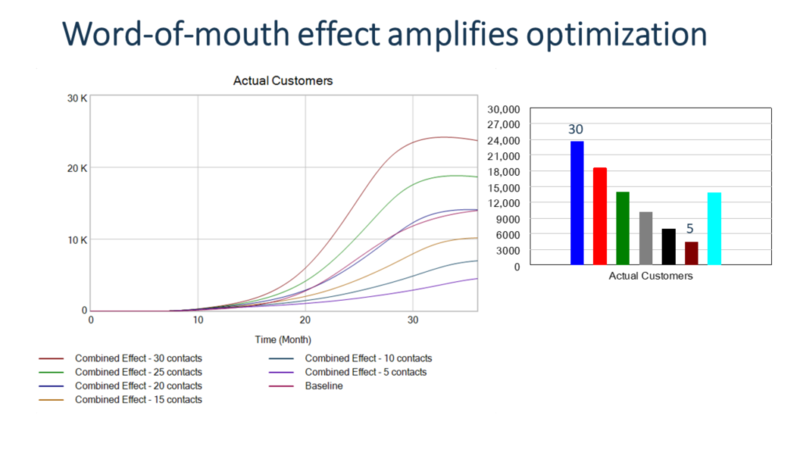 A low number of contacts generates a rather linear growth. Please check out also the related videos on the YouTube channel when I am explaining the reasons for the s-shaped growth pattern. 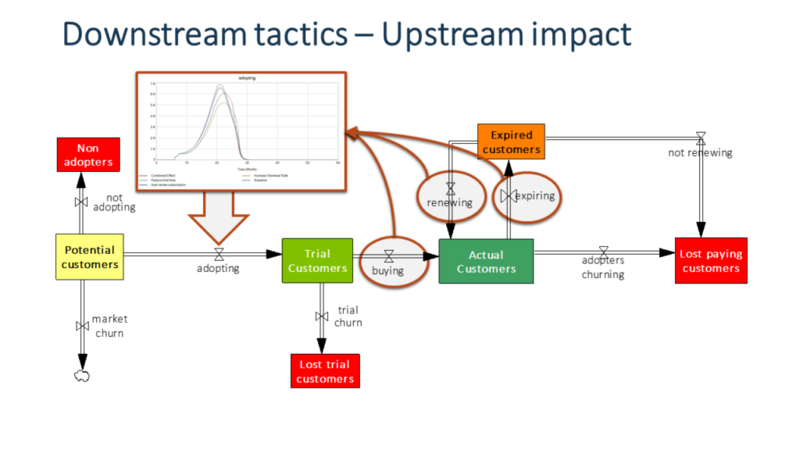 In this blog post I we explored 3 key strategies for your downstream marketing funnel and your customer base retention. 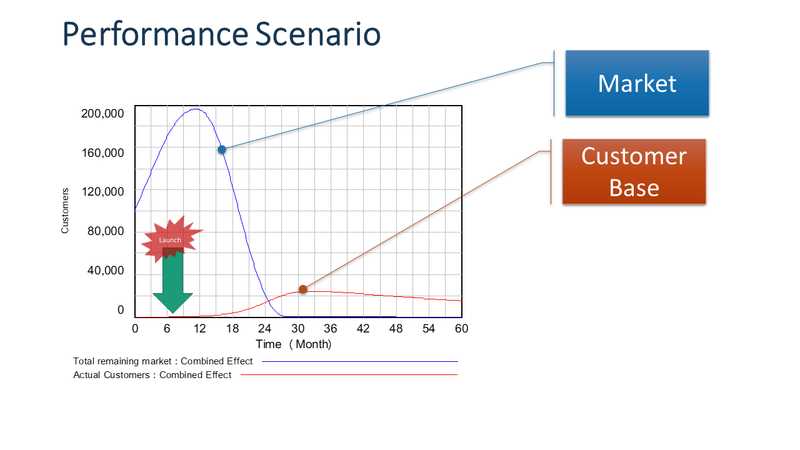 The improvement in this part of your SaaS or service delivery model can have a positive and compounding effect on your traffic acquisition and conversion in your upstream marketing funnel. Before implementing these ideas in your business, it is always prudent to conduct some tests and controlled experiments. And always make sure to have the dashboard in place to measure and monitor the effects on your key metrics. Check out the related material in the “idea,- cast” briefing and coaching series and on the YouTube channel.